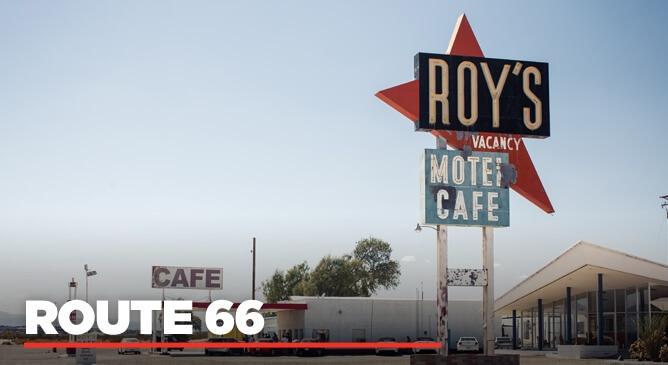 Cruising along Route 66 is what many of us see as the American Dream. America's Main Street is steeped in rich history, culture and the freedom of the open road. All of these features entice many of us to want to experience the ‘Mother Road’. On our escorted tour of the Historic Route 66 in conjunction with Titan Tours, we will allow you to experience all that makes this epic route from Chicago to LA famous and so special. The tour starts in Chicago where you have some free time to explore this beautiful city. Located on the shores of Lake Michigan, Chicago is a must see US city and it is the perfect starting point for an American tour to remember! Michigan Avenue and the Millennium Park are two must see spots during your free time in Chicago! On day three you will head off on an itinerary like no other as you start your Route 66 adventure. Our 17 day escorted Historic Route 66 tour will take you through cities including Oklahoma, Springfield, St Louis, Amarillo and Albuquerque to name but a few. All of these US cities and towns offer you so much to see and do and many of your excursions are included in the price of your package. You’ll also get to experience the breathtaking Grand Canyon and all while taking in two thousand miles of America along the way! Additional highlights of the tour include visiting Lincoln’s house and tomb, the Palo Duro State Park and the fascinating Museum of Transportation. You will also have the opportunity to pass over the Old Chain of Rocks Bridge which spans over the Mighty Mississippi River! From here you get amazing views of Downtown St Louis, a sight that is definitely worth seeing! Another unusual highlight of the tour includes a stop at the Petrified Forest National Park in Arizona, a park where the remnants of an ancient forest have been fossilised. With 15 nights in hotels, 11 excursions included and your flights to and from Ireland, this tour is not only the perfect blend of culture, history and the freedom of the open road but it is also amazing value for money. If you are looking for the most epic trip of a lifetime, contact one of our escorted tour experts today on 01-8173535.